Oh how I love biscuits! Even simply “rustic” drop type biscuits. These are super quick and easy to make and just add some “fun” to any meal. I’m finding that most of the recipes I make can vary each time I make them. Last week’s Vegan Zucchini Bread has been remade to include walnuts in the mix. A lot of times, it just depends on what I have on had as to what goes into the mix. This week is no different. Preheat the oven to 450 degrees F. Lightly oil a baking sheet and set aside. In a large bowl, combine the flour, baking powder and salt. Use a pastry blender or fork to cut in the margarine until the mixture resembles course crumbs. Add the soy milk, stirring just long enough to form a soft dough. Drop the dough by the tablespoonful onto the prepared baking sheet and bake until golden brown, 8 to 10 minutes. Serve hot. This week, I added shredded cheddar soy cheese to the recipe. Sometimes I add rosemary or other spices and possibly some green onions I may have around. I even tossed in some of the shredded zucchini I had left-over last week into a batch. 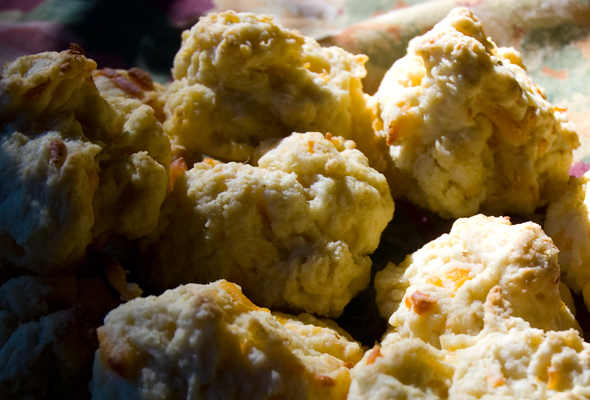 If you’d like to adjust this recipe to make regular biscuits. Use 2 cups of all-purpose flour and 1 tablespoon of baking powder. Then you can turn the dough onto a floured surface and kneed gently until the dough holds together. Shape the dough into 1/2 inch thick circle about 8 inches in diameter. Use a floured 2-inch biscuit cutter and cut the dough into rounds. Then, arrange the biscuits on a prepared baking sheet spacing them about an inch apart. Bake 8 to 10 minutes as above. Mmmmm… I love biscuits too. Those look and sound fantastic! what delicious looking biscuits! they won’t exactly pair with my “meatless monday” dish this week, but you an bet they’re on the menu this week. they look so flaky and yummy. what did you pair them with? Oh, so simple and so tasty- Looks like a winner to me!